The Southern Maryland Civil War Round Table is pleased to announce that its next meeting will take place on Tuesday, February 14, 2017 at 7:00pm at the College of Southern Maryland’s Center for Business and Industry, Chaney Enterprises Conference Center, Room BI-113, at 8730 Mitchell Road in La Plata, MD. GOTCHAA!!! 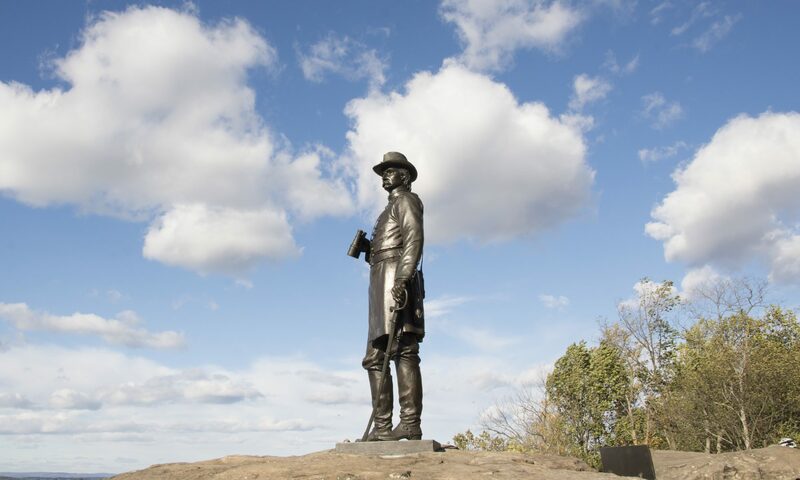 Tonight, we step away from our normal meeting format of guest speaker’s for a little something that should provide will prove to test your knowledge of Civil War generals, battles, politicians and other notable figures/events! Have you ever watched Jeopardy and wished that every category was related to the Civil War? Well, now’s your chance to make that wish a reality. Our February meeting will be based on Civil War-related facts and trivia. You will be in teams of 4 -6 depending on the number of attendees. Teams will be randomly assigned after the announcements are made; so do your research and come ready to win. The winning team will make history as the first winners of the Southern Maryland Civil War Round Table Facts and Trivia Contest. Come out and join us for the second season of Civil War films from 5:00pm – 6:45pm, prior to the regularly scheduled Round Table meeting tonight. Please note that tonight’s movie will be shown at the College of Southern Maryland’s Community Education Building, Room CE-101, 8730 Mitchell Road in La Plata, MD. Admission is free! The Southern Maryland Civil War Round Table is pleased to announce that its next meeting will take place on Tuesday, January 10, 2017 at 7:00pm at the College of Southern Maryland’s Center for Business and Industry, Chaney Enterprises Conference Center, Room BI-113, at 8730 Mitchell Road in La Plata, MD. Join William C. Connery as he recounts the notable events and battles that occurred in Northern Virginia in 1861 after the firing on Fort Sumter. In the mid-nineteenth century, Alexandria was a port across from the Nation’s Capital; Arlington was an 1100 acre estate managed by U.S. Colonel and Mrs. Robert E. Lee; Fairfax, Prince William and Loudoun Counties consisted of rolling farmland and tiny villages. This peaceful region was thrown into chaos as South Carolina seceded from the Union in Dec. 1860 and other slave states followed until Virginia finally joined the Confederacy in April and May 1861. The ‘invasion’ of Northern Virginia on May 24, 1861, created a no-man’s land between Yankee and Rebel armies, especially in the area south of Alexandria. Some citizens joined Confederate forces, while others stayed to face uncertainty. This book offers new insights into this most important time in American history. William S. Connery grew up in Baltimore, Maryland, considered ‘neutral territory’ in the Civil War. As a young boy, his family visited the battlefields of Gettysburg, Antietam, and other local historical sites. He has a degree in history from the University of Maryland. Since 1989, Mr. Connery has lived in Fairfax County. He contributes to the Civil War Courier and other publications. He was awarded the prestigious Jefferson Davis Historical Gold Medal by the Fairfax Chapter of the UDC for this book. His other book, Mosby’s Raids in Civil War Northern Virginia, deals with the Gray Ghost of the Confederacy, who became a friend of U.S. Grant after the War! Mr. Connery is a frequently requested speaker on the Civil War and other American history topics in the Washington, D.C., metro region. He can be reached at william.connery@verizon.net. Come out and join us for the second season of Civil War films from 5:15pm – 6:45pm, prior to the regularly scheduled Round table meeting tonight. Movies will be shown at the College of Southern Maryland’s Center for Business and Industry, Chaney Enterprises Conference Center, Room BI-113, at 8730 Mitchell Road in La Plata, MD. Admission is free! Set in Kentucky during the Civil War, the film tells the story of an encounter between a squadron of Union Army soldiers that take up residence at the farm of a woman whose husband is fighting in the Confederate States Army. Inspired by Shelby Foote’s books about the war, the film is based on a true story of a southern child who shot and killed a Union soldier. The Southern Maryland Civil War Round Table is pleased to announce that its next meeting will take place on Tuesday, December 13, 2016 at 7:00pm at the College of Southern Maryland’s Center for Business and Industry, Chaney Enterprises Conference Center, Room BI-113, at 8730 Mitchell Road in La Plata, MD. The Southern Maryland Civil War Round Table is pleased to welcome Paul O’Neil, who will discuss with us the Pratt Street Riots in Baltimore, MD. Mr. O’Neil will begin his talk with on overview of life and the political and war climate in Baltimore, MD in 1860. The ascendancy of Abraham Lincoln to President of the United States quickens the pace at which war may come, causing him to issue a call for volunteers, in order to preserve and protect the capitol city. These volunteer troops must travel through Baltimore to reach Washington, D.C. and on April 18th, unruly mobs launch an attack on these troops as they pass through Baltimore. Mr. O’Neil will analyze these events for us and the subsequent arrival of the 6th Massachusetts on April 19th and the riot that this precipitates. He will also provide insight on the arrival of and attack on the Washington Brigade of Pennsylvania volunteers as they arrive at the Pratt Street Station. To conclude, Mr. O’Neill will share with us the aftermath of these events and there affect on the war effort. Paul O’Neil became interested in the Civil War in 1961, when he was 8 years old. He did a scrapbook collection of photos for Cub Scouts, and poured over the hand drawn illustrated maps of battles found in the “American Heritage” history of the war, published at that time. His father helped his interest by driving him and younger brothers numerous times to Gettysburg, making sure to tell the boys about two different bank robberies that happened in Union Mills, MD. Paul still has photos of him at 9 or 10 wearing a Union campaign hat and carrying his toy musket. During his high school years, Paul worked on board the U.S.S. Constellation which, though wrongly called at that time, the frigate, is the only ship to actively serve in the war still afloat. It was as an unemployed social worker that Mr. O’Neil’s life once again was caught up in the war when, in July 2000, a friend let him know there was a job opening at the Baltimore Civil War Museum, which he quickly took. Paul was the museum manager as an employee of the Maryland Historical Society, until being laid off in 2006. The previously mentioned friend then let him know there was an opening on board the Constellation, to which he again returned to until this past October. Come out and join us for the second season of Civil War films from 4:30pm – 6:45pm, prior to the regularly scheduled Round Table meeting tonight. Movies will be shown at the College of Southern Maryland’s Center for Business and Industry, Chaney Enterprises Conference Center, Room BI-113, at 8730 Mitchell Road in La Plata, MD. Admission is free! Come out and join us for the second season of Civil War films from 5:30pm – 6:40pm, prior to the regularly scheduled Round table meeting tonight. Movies will be shown at the College of Southern Maryland’s Center for Business and Industry, Chaney Enterprises Conference Center, Room BI-113, at 8730 Mitchell Road in La Plata, MD. Admission is free! WHAT: Evening Conversation with Ronald White. *The Trinity Forum is a nonprofit organization that engages leaders with the great ideas of civilization in the context of faith for personal and societal renewal. With any questions about this event or the Trinity Forum, please contact Alyssa Abraham at aabraham@ttf.org or (202) 944-9881.